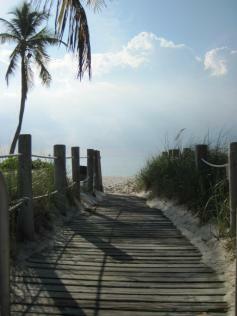 This picture looks just like a beach path at a house I stayed at on the island of Oahu 21 years ago. It evoked a very powerful memory from a walk I’d taken with my then husband. Most of my dialogue went on in my head. I never spoke as plainly as this. Had I, perhaps he would have felt the same way as this guy. Genre: Historical Truth Word Count: (for you, Rich) 100. – Oh for god’s sake, stop whining! – But it burns – my foot is on fire!! – You knew there were poisonous jellyfish on the beach. You knew we had our big plans tonight. It’s like you wanted to wreck everything. We can’t even take a romantic stroll on the beach without disaster. – Ouch – no, ouch – really, I just wasn’t looking. – What the hell. Might as well just accept we’re going nowhere. – You’re right – as usual, everything is my fault. OUCH! – Man up. Once this vacation is over, I’m never going anywhere with you again. – You’re right again. After this vacation, never. The photo prompt is courtesy of Renee Heath. Links to all the other Flash Friday Fictioneers can be found here. This entry was posted in Flash Friday Fiction and tagged flash friday fiction, Hawaii. Bookmark the permalink. There’s lots of double meanings here, especially this line: ‘Might as well just accept we’re going nowhere.’ I like it. Oh dear! Not idyllic for everyone then, this photo prompt. Nice work – you expressed the emotions very clearly in dialogue. How awful! I saw someone get stung before. They were in so much pain. Ouch, this feels so real – I’m not sure if the sting is worse, or the pain of the emotions! I like how, with fiction, we can replay a scene and have it work out a different way (or say things we might wish we’d said!) Good job. That guy is a real peach of a man. I don’t think I’d even continue the vacation with such a person. Sorry I meant that lady is a real peach of a woman. I had them inverted in my mind for some reason… 🙂 Good story. You did a great job at making the dialogue realistic. well, hello to you too! love the bickering, but it would be hard to believe (not impossible at all) that he would step on it intentionally. that’s some nasty pain. but i like how she’s the one saying no to future trips. atta girl! I like the way the title can be taken two ways–literally with the jellyfish sting and figuratively in what’s happening to the relationship. Sorry to see that it was a real poison in your actual relationship. 😦 Your dialogue is unfortunately all too realistic. Nothing more ugly than an unhappy woman. I’d say poison describes this relationship. Your dialogue is sadly believable and happily well written. This was full of nuanced meaning which makes for a good read. Nicely done. PS — I’ve never seen a jellyfish ( so far ) but I thought they couldn’t sting once they washed up on shore. I will file that away as a note to self — don’t prod one with a bare foot. More than mere bickering. That was vicious. ‘You’re right again.’ This time for the last it seems. Seems like getting out from under. Sounds as if the truth here came with painful consequences. I hope things are better for you now. Nice work prtraying the moods. Well, I can see why that relationship didn’t last! Ouch. Good dialog.